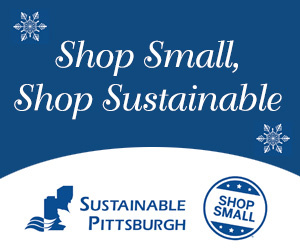 This holiday season, Sustainable Pittsburgh invites you to Shop Small, AND Sustainable at your local sustainable small businesses! More than 200 small business owners in 37 area communities have earned recognition as an official Sustainable Small Business. Sustainable Pittsburgh created the Sustainable Small Business performance program to elevate small business owners who are working to make their business and community more equitable, prosperous and environmentally responsible. Types of sustainable small businesses include bakeries, clothing boutiques, hobby shops, florists, salons, barbers, restaurants, bookshops and more. A full list and map of the designated businesses are available here: shopsustainablesmallbiz.org. You can help get the word out and celebrate southwestern Pennsylvania’s growing sustainable small business community using #shopsustainablesmallbiz. Please shop local this holiday season and support Sustainable Small Businesses. Follow the Sustainable Small Business program on Twitter and Facebook. Are you a business owner who would like to become part of this growing community? More information is available on Sustainable Pittsburgh’s Champions for Sustainability website.